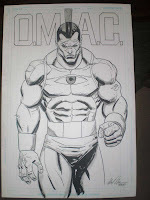 Mike Hawthorne: Charity art sale - O.M.A.C. Charity art sale - O.M.A.C. I have a friend who's wife has just been diagnosed with stage four cancer. My friend, who is a freelancer too and, as you can imagine, is struggling to get by. There is no such thing as paid vacation time or leave in the freelance world, and he's having to shuttle his wife to treatment as well as care for their son. A group of us are trying to raise some money for him, to help him out. I've decided to do some commission pieces to sell with ALL the money going to my pal, I'll pay shipping. I don't ever do commissions at home, so this is a unique deal. 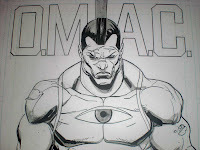 Here's the first piece - O.M.A.C. It's 11.5"x17, on actual DC paper. Just be sure to drop me a line if you mail an order in, so I hold it for you. Also, keep an eye out for more pieces soon. Mike, Sorry to hear about your friend's wife. You're doing a great thing for them and fans of your work. I wish you all the best. Thanks man. I just hope I can sell these and give the dude a little relief!! UPDATE! Charity art sale - O.M.A.C.